In case you want a refresher on what took place on the previous chapter (Genesis 27) of Genesis you can listen to my study of it entitled Thy Will Be Done? where I discuss how Jacob deceived his father Isaac and stole his brother Esau’s blessing. Esau did not take it very well and planned to kill Jacob (Genesis 27:41). Rebekah, their mother, heard and told Jacob to flee to her brother Laban. Genesis 28 opens with Isaac calling and blessing Jacob. Then Isaac called Jacob and blessed him, and charged him, and said to him: “You shall not take a wife from the daughters of Canaan. This time there was no deception, the blessing was meant for Jacob, and the blessing included descendants and land. Suddenly Esau noticed that his father and mother did not like his Hittite wives. (Genesis 26:34-35) So he decides to take another wife, a descendant of Abraham! So he marries Mahalath, the daughter of Ishmael, in addition to the wives he had. I want to give Esau points for trying, but in marrying the daughter of Ishmael he ends up identifying himself more with the outcast son. Sadly the wilderness tribes that come from their family union historically opposed the descendants of Jacob in the land (Psalm 83:6). In English, we don’t really notice that Jacob arrived at “the place” since most English translations don’t translate the definite article the word place possesses in the original Hebrew. To be honest, I don’t read the Bible in its original language and I had not realized this until it was pointed out to me. The phrase “the place” is actually repeated three times in Genesis 28:11 for emphasis and definiteness (Matthews p.449) The presence of God makes this otherwise public space holy. I would like to take a moment to highlight a small detail that a friend pointed out to me. Jacob stops at this place “because the sun had set” (Genesis 28:11 NKJV) but not only that, Jacob is there because he deceived his father and stole his brother’s blessing. Jacob is camping, apparently in the middle of nowhere, because he lied and cheated and is currently on the run. Jacob’s poor choices put his life in danger, his own brother wants to kill him. Jacob’s deception has ushered a difficult period in his life, and it will get worse before it gets better. I wish to highlight the apparently small detail that the sun had set I believe it signifies the beginning of a period of darkness in the life of Jacob. I would like to suggest to you that this period of darkness will last until Jacob finds himself wrestling with someOne until daybreak. (spoiler alert Genesis 32:26) I just want you to keep this in the back of your mind as we continue our journey through Genesis. When we get to that post I will bring this up again. Now we arrived at what could be called the heart of the passage. This dream at first should remind us of the tower of Babel, a tower that reached toward heaven. (Genesis 11:4) However, the tower of Babel was built because of human ambition, it represented a human effort to reach heaven, or the house of the gods. The stairway or ladder signify a divine presence and mediation. The tower of Babel, though the first is not the first human structure to try to reach the realm of the gods. Many civilizations incorporated the building of structures that reach to the heavens (pyramids/ziggurats), to approach the realm of the gods as part of their religion/worship. The ladder in Jacobs dream reminds us that we do not reach God by our own efforts. We do not strain and build and invest and reach God, that would never work. The truth is that only God can provide a way for us to reach Him. But Jacob’s dream did not stop with the stairway/ladder. It was Esau, not Jacob, who appeared to have gained the possessions of their father despite the stolen blessing. All that Jacob had to rely on was the word of the Lord, and he patiently waited for twenty years until the divine directive came to return. He found that to trust God’s promises was sufficient no matter how long the delay. Jacob wakes up aware of a new reality, there is a connection between heaven and earth. This is a reality that must be revealed by God. We are unable to find Him unless He reveals Himself to us. 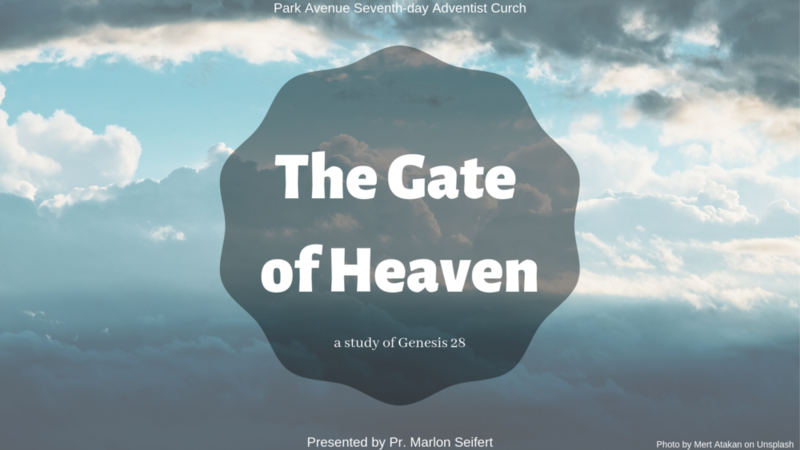 The phrase gate of heaven is used only here in the entire Hebrew Bible and it reminds us of the name Bab-El “gate of God.” Ironically humans were never able to reach the gate of heaven. Interestingly the gate of heaven parallels the phrase the house of God. We see here early indicators of an earthly sanctuary pointing to its heavenly counterpart. God initiates it, He reveals it to us, and allows us to better understand heavenly realities. 18 Then Jacob rose early in the morning, and took the stone that he had put at his head, set it up as a pillar, and poured oil on top of it. 19 And he called the name of that place Bethel; but the name of that city had been Luz previously. Jacob now takes that pillar and anoints it consecrating the stone as a monument conveying a spiritual lesson. The stone is a reminder of the lessons of Jacob’s ladder, the heaven-earth connection. I believe this connection will not be fully appreciated until Jesus’ crucifixion (John 8:28) and resurrection, but we see God revealing Himself here, teaching Jacob that we can only reach the presence of God through God’s gift. The stone is not worshiped, and Jacob does not believe that God somehow lives in that stone, the stone is not the house of God, but a reminder of a spiritual truth. While the name Babylon means the gate of the gods here we have a revelation of the true gate of heaven, the house of God, and it is not about our efforts but all about God’s grace and interest in connecting with us. The stone was only a symbol of God’s desire to connect with us and one that will be used again in the New Testament (Ephesians 2:20; 1 Peter 2:6). Jacob is the only patriarch who makes a formal vow to God. Jacob is asking that God do exactly what God promised him in a dream. The interesting thing is that Jacob can only fulfill his vow if God keeps His word and stays true to his promises. Which means, Jacob can only return a tithe to God if God first blesses him with something. Remember, Jacob has nothing. He left his father and mother, his brother wants to kill him, and he has no wife, no land, no home, nothing, except God’s promises. But as long as God gives Jacob bread to eat and clothing to put on, and keeps him in his travels, and brings him home safely He will be Jacob’s God and Jacob will give him a tenth of all that He gives Jacob. Has God given you food to eat? Like Jacob, do we want to enter into this covenant with God? Returning to Him 10% of all that He gives us? Because let me tell you about The Gate of the Heavens. Jesus is the connection between heaven and earth. Jesus is also the only way to heaven. And Jesus is coming soon to take us to be with Him. In the end, it is all about Jesus and His desire to be our God, to provide for us life more abundant here on earth and eternal life in heaven. Maybe you feel like Jacob right now, like the sun has set, and you’re scared and alone and its dark and you’re not sure what the future holds. Maybe you feel bad, alone, guilty, like this is all your fault. Maybe you have contributed to your current situation. Maybe you’re trying to sleep with a rock as your pillow, or using the rock as a shelter for your head while you sleep all alone and scared in the dark. Jesus is the Stairway, He is the Stone, He is the Gate of Heaven, and He takes the initiative to reveal Himself to you and to save you. You cannot save yourself any more than you can build a stairway to heaven. But Jesus is willing to save you. Make a vow with Him as Jacob did, claim His promises, and promise to make Him your God. Jacob woke up and he had nothing but a promise, but let me tell you, a promise of God is plenty, we can stand on His promises.